TBA. Giggle Gallery at FAO Schwartz NYC. Rockefeller Center Plaza, Manhattan, NYC. Est Aug 2019. TBA. Museum Artist-in-Residence & Exhibition. Juliet Art Museum at the Clay Center. Charleston, WV. Est Aug – Nov 2019. Metamorphesis. Curated by Okuda San Migel. Heron Arts. San Francisco, CA. Apr 26 – May 11, 2019. Inaugural Juliet Art Museum Invitational Exhibition. Juliet Art Museum at the Clay Center. Charleston, WV. Mar 21 – June 16, 2019. Googly-Eyed in Wonderland. Solo Exhibition. TAS Gallery. Charleston, WV. Oct 20 – Dec 1, 2018. Theriomorphism V. Kreisler Gallery. Ink and Movement Exhibition. Madrid, Spain. Feb 20 — 28, 2018. SCOPE Miami Beach International Contemporary Art Show. Art Basel Miami Art Week. ArtePonte Gallery, Basel, Switzerland. Miami Beach, Florida. Dec 5 – Dec 10, 2017. RuPaul's Drag Con. Manhattan, NYC. Sept 9 – 10, 2017. Featured [SOLO] Artist. 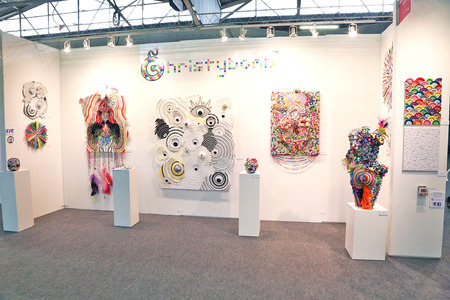 Art Expo New York @ Pier 94. Manhattan, NYC. Apr 21 – 24, 2017. SCOPE Miami Beach International Contemporary Art Show. Art Basel Miami Art Week. ArtePonte Gallery, Basel, Switzerland. Miami Beach, Florida. Nov 29 – Dec 4, 2016. Upprisa, a collaboration with Yoko Ono. Reykjavík Art Museum. Reykjavík, Iceland. Oct 7 – Feb 5, 2017. Tiny Bar @ Beverly's. Material Art Fair. Mexico City, MX. Feb 4 – 7, 2016. Dwelling. 107 Projects Gallery. Sydney, Australia. Oct 29 – Dec 7, 2015. Red Eye Black Tie. MEAD Art Museum. Amherst College. Amherst, Massachusetts. Apr 12 — 13, 2018. [SOLO]. Featured Artist. Art Expo New York Contemporary Art Show. Pier 94. Manhattan, NYC. Apr 14 – 17, 2017. Heartbomb. Solo Exhibition @ BAF Gallery. Brooklyn, NYC. Feb 12 – Feb 28, 2017. Acid Free. Lazy Susan Gallery. Manhattan, NYC. Oct 26 – Nov 1, 2016. Art Expo [SOLO] NYC. 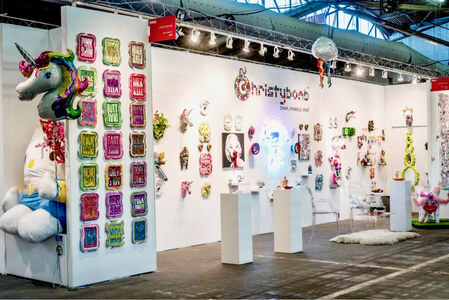 World's Largest International Fine Arts Fair @ Pier 94. Manhattan, NYC. Apr 14 – 17, 2016. Lead muralist for Citifield McFadden’s. Queens, NYC. May 2015. Art, Sushi & Sake. Turner Colourworks Japan @ Jerry’s International Palette Shop. Manhattan, NYC. Sept 13, 2015. Art, Sushi, Sake. Turner Colorworks Japan @ Jerry’s International Palette Shop. Manhattan, NYC. Nov 20, 2014. The Greatest Show On Earth. Sideshow Gallery. Williamsburg, Brooklyn, NYC. Jan 6 – Apr 14, 2018. Small Works. Sidney Mishkin Gallery. Manhattan, NYC. Feb 16 – Mar 15, 2018. Visual AIDS: Postcards from the Edge. Gallery 524. Manhattan, NYC. Jan 19 – 21, 2018. The Access Room: A Small Works Exhibition. Contemporary 33 Gallery. Chicago, IL. Nov 17 – Dec 30, 2017. Winter Magic. TAS Gallery. Charleston, WV. Nov 27 – Dec 23, 2017. Shades of Summer. TAS Gallery. Charleston, WV. Jul 11 – Sep, 2, 2017. Small Works. Sidney Mishkin Gallery. Manhattan, NYC. Mar 2 – Mar 28, 2017. LAYERED. 33 Contemporary Gallery. Chicago, IL. Jan 20 – Mar 3, 2017. Geometrics. TAS Gallery. Charleston, WV. Feb 11 – Mar, 31, 2017. Visual AIDS: Postcards from the Edge. Metro Pictures. Manhattan, NYC. Jan 13 – 15, 2017. Thru the Rabbit Hole 2. Sideshow Gallery. Williamsburg, Brooklyn, NYC. Jan 9 – Apr 10, 2017. Kaizen. TAS Gallery. Charleston, WV. Jan 3 – Feb, 7, 2017. Deck the Walls. TAS Gallery. Charleston, WV. Nov 28 – Dec, 24 2016. Points of View. Lazy Susan Gallery. Manhattan, NYC. Nov 22 – Dec 4, 2016. Making the Future. David and Sweitzer Contemporary. Brooklyn, NYC. Sept 30 – Oct 16, 2016. Reinventing Ourselves from Another Point of View. 33 Contemporary Gallery. Chicago, IL. Aug 19, 2016. Brooklyn Arts Habitat Group Exhibition. BAF Gallery. Brooklyn, NYC. July 23, 2016. UNCF Benefit. The Untitled Space. Manhattan, NYC. Jul 19, 2016. Parallel Lives. Next Level Gallery. Chicago, IL. May 20 – Jun, 2016. Diorama-rama. Club 157. Brooklyn, NYC. May 13 – Jun 19, 2016. Artists in the Kitchen. Hell's Kitchen Art Week @ Gateway Art Center. Manhattan, NYC. May 13 – 15, 2016. Gallery 1426. Manhattan, NYC. Apr 28 – June 28, 2016. Thinking with Our Hands. Rabbit Hole Projects. Brooklyn, NYC. Apr 20 – 21, 2016. Small Works. Sidney Mishkin Gallery. Manhattan, NYC. Apr 14 – May 13, 2016. Dreamcatching. Club 157. Brooklyn, NYC. Mar 11 – Apr 3, 2016. Salon Showcase. The Greenpoint Gallery. Bushwick, Brooklyn, NYC. Feb 26, 2016. Visual AIDS: Postcards from the Edge. Sikkema Jenkins & Co. Manhattan, NYC. Jan 29 – 31, 2016. Thru The Rabbit Hole. Sideshow Gallery. Williamsburg, Brooklyn, NYC. Jan 9 – Apr 10, 2016. La MaMa Family Show. La MaMa La Galleria. Manhattan, NYC. Dec 22 – Jan 3, 2016. Kunstkammer. Parenthesis Art Space. Brooklyn, NYC. Nov 19 – Dec 29, 2015. Last Dance. Old Gem. Arts@Renaissance. Williamsburg, Brooklyn, NYC. June 12 – 13, 2015. Summer Thesis. Parenthesis Art Space for Bushwick Open Studios. Brooklyn, NYC. June 6 – 7, 2015. The Ruins. SVA Gramercy Gallery. Manhattan, NYC. May 29 – June 13, 2015. MFA Fine Arts Open Studios. SVA. Manhattan, NYC. Spring 2015. Small Works. Sidney Mishkin Gallery. Manhattan, NYC. Mar 27 – May 7, 2015. NYC Salon Showcase: A Weekend at the Old Gem. Arts@Renaissance. Williamsburg, Brooklyn, NYC. Feb 27 – Mar 1, 2015. Visual AIDS: Postcards from the Edge. Luhring Augustine. Manhattan NYC. Jan 30 – Feb 1, 2015. Paperazzi IV. Janet Kurnatowski Gallery. Greenpoint, Brooklyn, NYC. Jan 16 – Feb 15, 2015. Circle the Wagons. Sideshow Gallery. Williamsburg, Brooklyn, NYC. Jan 10 – Mar 15, 2015. Glitter is the Herpes of the Art World. Bio-Arts Lab, SVA. Manhattan, NYC. Spring 2014. The Last Brucennial. Manhattan, NYC. Mar 6 – Apr 4, 2014.